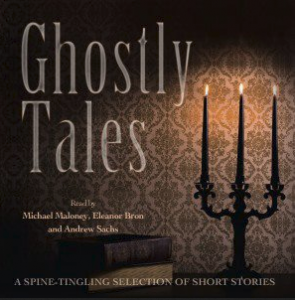 While my past reviews of audio books from AudioGo have consisted of reissues of 80’s releases from Tangled Web Audio, Ghostly Tales marks the first time I’ll be reviewing a more recent audio book commissioned by AudioGo. It also marks the first time I’ve reviewed an audio book with multiple narrators, as the four scary stories that make it up are read by Michael Maloney, Eleanor Bron and Andrew Sachs. Despite the presence of two famed comedic performers, their readings are anything but funny. Michael Maloney narrates both “The Phantom Coach” and “The Tapestried Chamber” and his commanding voice is a perfect fit. He has a nice range for performing other characters in the stories, but in true audio book style, they’re all clearly done by the same person. My only compliant is that all of the great atmosphere set up about the isolated cabin described in “The Phantom Coach” is never followed up on by the author. Elenor Bron handles the narrating duties for “The Judge House,” presumably to avoid the silliness of having a male narrator trying to deliver all of the numerous lines from a female character. Using her both elegant and experienced voice, Bron opts not to adopt any obvious character voices and instead lets the story speak for itself. This is a wise move, as Stoker’s effective writing (and rather unique approach to the presence haunting the titular house) easily drawn the listener into the story, to the point where they can practically hear the scrabbling of the rats in the walls. Finally, Andrew Sachs’ performance in “The Man of Science” offers the best vocal range of the three narrators (although Michael Maloney is my favorite of the narrators in terms of performance). His accents are all well-done and I found the encounter at a church between the two people involved in the chase to be excellent in terms of both writing and telling. Although the music used at the intro and outro of each tale potentially limits this collection’s use for a “storyteller” prop, it’s extremely well done and I would gladly pay for an album full of similar tracks. As was the case with their releases of various radio drama series, AudioGo has released a double CD set for this collection of four stories (which runs for a total of 2 hours and 19 minutes). Said stories are all unabridged, even when a passing reference to a character in “The Tapestried Chamber” having acted as a (and I quote) “fag” for the main character in their school days. Obviously, its meaning then is completely different from what it means today. It’s actually a reference to having worked as a servant for an upperclassman (although some speculate there might be a link between the two meanings). Sadly, this collection lacks any sort of liner notes and only offers some brief narrator biographies instead. However, interested parties can find some great footnotes for “The Tapestried Chamber” here. Other than that minor quibble, it’s great for anyone looking for a spooky way to pass an evening. Special thanks to AudioGo LTD for the review copy!